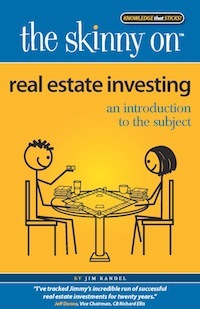 When I consented to review The Skinny on Real Estate Investing, I assumed I’d be reviewing a book, and not a pamphlet illustrated by my 8-year old niece who drools a lot and still has some trouble negotiating bathroom time. This review might run longer than the book itself. Jim Randel’s series of illustrated The Skinny on titles boasts that it’s “For Really Busy People!” It’s also suitable For Really Fidgety People who can’t get through a book longer than 10,000 words. The lengthiest passage is the introduction, which runs a full page and explains The Skinny on’s M.O. of culling swaths of information into a workable whole. But it doesn’t explain the distracting primary illustrations that adorn every page. The jacket quotes all attest to Randel’s success as an investor, but none of them speak about the book itself. Randel is an attorney, with condescension in his blood. He’s in love with his own (lame) sense of humor, and uses an asterisk in one panel with the footnote, “*Did you catch the metaphor?” No, I didn’t. Please explain it to me again, Attorney Boy, using something less complex than kindergarten sentences. Randel also has an amateur’s pedantic insistence on avoiding contractions, the bane of the self-important, self-published, self-righteous author. This makes for a book that is simultaneously juvenile and stilted. Maybe Randel avoids apostrophes because he can’t punctuate – he uses “+/-25%” where “~25%” should go, which makes a huge difference when calculating home values. It’s barely possible to repeat yourself in a book this short, but he does. Did you know Randel was born in Perkins, Ohio? If you didn’t, don’t worry. He’ll tell you again. Several times. He even puts a commercial for one of his other books right in the middle of the narrative. The Skinny on Real Estate Investing is effectively a black-and-white comic book. It concerns a married stick-figure couple, ready to leave their workaday stick-figure lives and invest their way to stick-figure affluence. The husband gets suckered into attending a huckster’s “wealth-building” seminar – you know, because men are impulsive and scatterbrained while women are sensible and rational – when Randel himself jumps into the couple’s lives (literally, out of a plane) to right the ship. The key to all real estate investing is understanding what is called a cash-flow analysis. The logic of this analysis is the same whether you are buying a single-family house or a huge shopping center. The larger the property, the more numbers you need to review, but the methodology is the same. You mean, if its price was almost certain to skyrocket? Speak English. This book is short, but it’s anything but concise. Randel explains legitimately important concepts like return on investment, leverage, cap rate and cash flow, but buries them in a style that no sane person will wallow through. Randel moves effortlessly from simplistic to over the reader’s head. For instance, he drops a reference to Class A vs. Class B office space halfway through the book, but never bothers explaining it. * He adds that if you want to buy a property and you’re illiquid, you should ask the current owner to “take back a second mortgage”, again without explanation. Even the layout is garbage. In some illustrated panels, the publisher uses a font visible only to prairie falcons. Sure enough, the content therein is some of the most valuable in the book. I’m not sure which is more galling: Randel announcing that The Skinny on Real Estate Investing is just the first in a series; or him charging $14 for a book that clearly took him an afternoon to write, possibly a drunken one. -don’t invest in real estate that doesn’t offer >10% cash-on-cash return. What’s cash-on-cash return? Sorry, that’s a topic for another book. * There are three classes: A, B, and you can probably figure out the third. A Class “A” office building is at least 120,000 square feet. The term can even refer to multiple adjacent detached buildings that share an owner. A building this big should have a full-time property manager, maintenance person, and steward. There’s more to the definition than size, though — and almost all of it is subjective. A Class “A” building should be in a “good” neighborhood and have other amenities like covered parking and some sort of concentration on aesthetics. Class “A” means cachet for its tenants. A Class “A” building has at least 3 floors and can cost more than $200/square foot to build. Class “C” is the bottom end of the market — for example, converted houses in old parts of town. Which means Class “B” is everything else — functional, decent buildings that were built for the express purpose of accommodating businesses, but aren’t places you would stick your chest out and brag about renting at. Were you commissioned by the author or the publisher to review this book? How did you hear about it? Ray solicited book reviewers, I responded, and a few days later the book arrived from the publisher. A while ago we asked if anyone was interested in reviewing books, we got a large response and Greg was one of them. He volunteered to review books for us, we do not pay him (or any other reviewers) the only thing he gets is a review copy of the book.